This patch in the sky contains many interesting obejects. 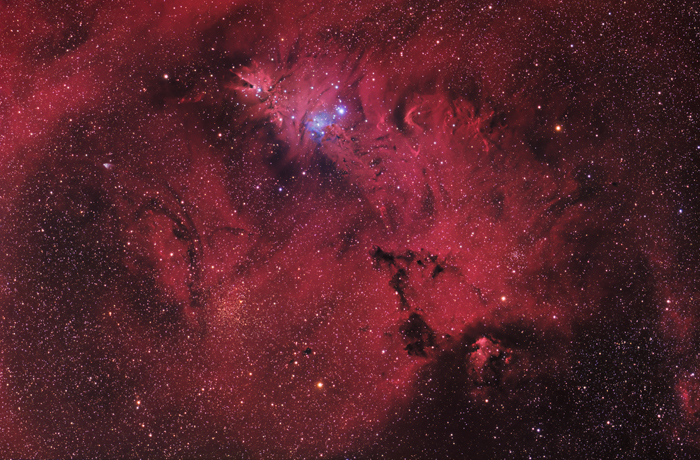 A larger section in the top area of the image is catalogued as NGC2264, containing the Cone Nebula and the Christmas Tree Cluster (mag 3.9). The Fox Fur Nebula is also part of this assemblage and describes the quaint looking structure just to the bottom right of the blue reflection nebula. The Cone Nebula is visible towards the top left and is also part of the much larger molecular cloud. 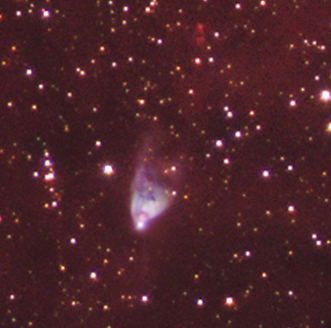 The cone's shape comes from a dark absorption nebula consisting of cold molecular hydrogen and dust in front of the faint emission nebula that mainly contains ionized hydrogen. The ionization is mostly due to the brightest star in NGC2264, S Monocerotis. It is a quadruple system of very young massive and hot stars. The area is located about 2600 light years from Earth. An old open cluster - Trumpler 5 - is visible towards the lower left of the image center. As star clusters age, stars usually drift away from each other in a process that accelerates with time. Trumpler 5 is one of these clusters that are big enough to retain their identity longer than usual. The star cluster is thought to be on the edge of the Monoceros molecular cloud. Hubble's variable nebula (NGC2261) is visible in the left image part. A 150% crop is shown beside. Edwin Hubble observed this curious variable reflection nebula in 1916. Most probably the variability is caused by opaque dust clouds moving between the hidden star (R Monocerotis) and the outskirts of the nebula. There is no obvious regularity in the change of shape which can sometimes be noticed in just a few weeks. The gas and dust itself fans out from R Monocerotis. NGC2261 is about one light-year across and lies about 2500 light years away from us.